Some depressed patients who don't respond to or tolerate antidepressant medications may benefit from a non-invasive treatment that stimulates the brain with a pulsing electromagnet, a study suggests. 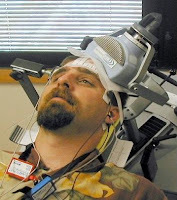 This first industry-independent, multi-site, randomized, tightly controlled trial of repetitive transcranial magnetic stimulation (rTMS) (http://www.nimh.nih.gov/health/topics/brain-stimulation-therapies/brain-stimulation-therapies.shtml) found that it produced significant antidepressant effects in a subgroup of patients, with few side effects. "Although rTMS treatment has not yet lived up to early hopes that it might replace more invasive therapies, this study suggests that the treatment may be effective in at least some treatment-resistant patients," said Thomas R. Insel, M.D., director of the National Institute of Mental Health (NIMH), part of the National Institutes of Health, which funded the study. "This study should help settle the debate about whether rTMS works for depression," said George, who led the research team. "We can now follow up clues suggesting ways to improve its effectiveness, and hopefully further develop a potential new class of stimulation treatments for other brain disorders." The treatment aims to jump-start underactive mood-regulating circuitry by targeting the top left front part of the brain with an electromagnetic coil that emits 3,000 pulses over a 37-minute session. It can be safely administered in a doctor’s office with few side effects – unlike more invasive brain stimulation treatments, such as electroconvulsive therapy (ECT) (http://www.nimh.nih.gov/health/topics/brain-stimulation-therapies/brain-stimulation-therapies.shtml) (See Background below). A sample of 190 patients who had previously failed to respond to antidepressant medications received at least three weeks of randomized, controlled magnetic stimulations on weekdays for three weeks, with the rTMS magnet aimed at their brain's left prefrontal cortex. Those who showed improvement received up to an additional three weeks of such blinded treatment. Thirteen (14 percent) of 92 patients who received the active treatment achieved remission, compared to 5 (about 5 percent) of 98 patients who received the simulation treatment. Patients who received active rTMS were significantly more likely to reach remission, particularly if they had been moderately, rather than severely, treatment resistant. The remission rate climbed to nearly 30 percent in an open-label phase of this study in which there was no simulation control. George said this is comparable to rates seen in the STAR*D (http://www.nimh.nih.gov/trials/practical/stard/index.shtml) medication studies. However, the researchers note that "the overall number of remitters and responders was less than one would like with a treatment that requires daily intervention for three weeks or more, even with a benign side effect profile." Patients who responded to active treatment received up to three weeks of additional blinded, controlled rTMS until they achieved remission or stopped showing a meaningful response – so the number of responders did not differ significantly from the number of remitters. These patients who remitted then received a combination of medications intended to help maintain the treatment effect. Despite failing to respond to medications in the past, most remained in remission for several months. "For treatment resistant-patients, we found that rTMS is at least as good as current medications or anything else we have available, except ECT,” said George. “Our current antidepressants do not work for many people." Using magnetic resonance imaging (MRI) scans of patients' brains showing exactly where the magnetic coil was positioned, the researchers hope to confirm earlier findings suggesting that a more forward and to-the-side placement produces a larger therapeutic effect. They plan to report the results of the MRI analysis at the American Psychiatric Association meeting in late May.